In my previous post I wrote about Andrew Johnson, the man who became President after Lincoln was assassinated. Here I share what I learned from a reading of his life in Hans Trefousse’s biography of Johnson. 1) Convictions can blind us. Generally, one’s strengths are also one’s weaknesses. Johnson’s stalwart, devil-may-care clinging to his beliefs, led him to act unilaterally in restoring the country as he thought should be done. Being sympathetic with the South, and not a supporter of the ex-slaves, he set a very low bar for re-admission to the Union. Actually he believed that the southern states never truly seceded at all since in his reading of the Constitution a state could not legally remove itself from the Union. So as long as they ratified the 13th Amendment and made a vague promise of loyalty, they could come back. Congress generally thought otherwise, and fought against the President. It was a confusing time, and I don’t claim to understand it, although I am looking forward to learning more as I read Grant’s biography. But it is clear to me that it was wrong for Johnson to claim sole authority to bring about restoration, ignoring the many opinions and ideas being circulated. He was certain he was right, and refused to consider the ideas of others. And the country suffered for it. 2) How do we use the power we have? We all have beliefs and convictions. When do we stand by them “to the death,” and when do we compromise and strive to work with those who have other convictions or beliefs? As a pastor, I certainly have my non-negotiables, and many of these I share with the leadership of the church I serve. But beyond those, my responsibility is to lead with, not over, the lay leaders. I may have strong opinions about what we should do in a certain area, but so do my leaders. It is not for me to simply enforce what I want, even if I can. My calling is to work together with the leadership to find solutions and to make decisions. And the more crucial the decision, the more important that is. The future of our church, not unlike the future of the country, is not solely up to me to decide. Nor was it Johnson’s. And when you act as though it is your decision, you may find yourself impeached, just like Johnson. Use the power you have, but don’t exceed it, not just for your own good, but for the good of the church too. Johnson, because of his bullheadedness, squandered the opportunity the country had to do Reconstruction right. Instead, the course was set for a future of continued racism, white supremacy, and Jim Crow. 3) Integrity under fire, even when you deserve to burn. 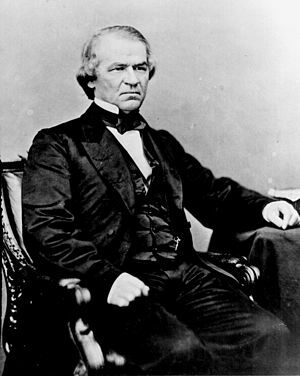 Andrew Johnson deserved to be humbled for his arrogance and his over-stepping, but he was acquitted of the charges brought against him in his impeachment. There was no evidence of “high crimes and misdemeanors”. And everyone really knew that. But, drawing on that inner well of conviction, Johnson weathered the storm with integrity. He continued to do his job, did not strike back at his enemies, and kept the course he had always followed. After his generally failed presidency, he even had the wherewithal to get elected to the Senate again. That impresses me. Is that well of conviction in me strong enough to see me through adversity, deserved or undeserved, and keep me working for what I believe in? I don’t want to do what Andrew Johnson did, and I don’t think I will. But my certainty of that may be simply because I know I don’t have the strength of conviction that he had. Does that make me stronger? Or weaker? This entry was posted in Books and tagged Andrew Johnson, Biography, Leadership, ministry, U.S. History, U.S. Presidents on November 15, 2013 by revkamcclain.